‘The Book to Come’ Session II (Vilnius). NERO: ‘On remediation’ – Reading group. Photo: CAC Vilnius. 2pm / Contemporary Art Centre, Vilnius / Session II (Vilnius) / CAC Reading Room / Preceded by a artist talk on Friday 11 December. The work of Marcel Broodthaers can be regarded as one of the first cases of post-medium practice, and Un Voyage en Mer du Nord (1973–74) in its genetic redundancy, as one clear example of a work that insists on the fundamental instability and indefiniteness of media. Indeed, it demonstrates that the space between one medium and another is never completely linear. Today, books in general seem to be increasingly less tied to the idea of being transparent media. The proliferation of technologies and new media has transformed the book into a more complex cultural object, which is often a place for remediation. A number of cases in the history of bookmaking have worked on this very idea challenging the controversial status of the book medium mainly through what we call “state changes”. 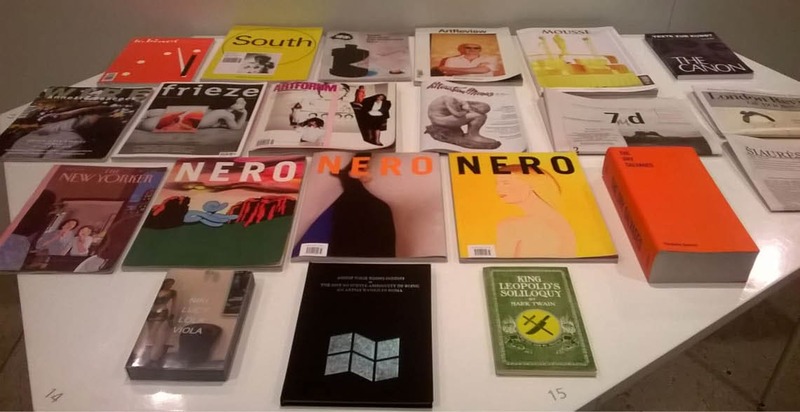 Founded in 2004, Rome, NERO started out as a free cultural magazine, but within the space of just a few years it had turned into one of the best-known and most influential institutions in the world of contemporary arts in Italy and beyond. NERO is an agency that works in the field of culture and the arts in a number of different sectors and formats. These include publishing, criticism, research, consultancy, design, art direction and event production, all of which are viewed as concurrent instruments to be used for conveying thoughts, ideas and issues about our historic and social present. One of NERO’s prime objectives is to overcome the barriers between disciplines, bringing to bear new, multi-format investigations and processes of representation in order to create trajectories that go beyond the individual fields of knowledge. NERO juxtaposes meanings, forms, content, languages and positions with a desire to bring about a cultural discourse that is not self-referential but that brings into question pre-constituted categories, traditions and ideologies. The presentation of the project The Book to Come at CAC Vilnius is supported by the Lithuanian Council for Culture.